Hash browns or home fries? 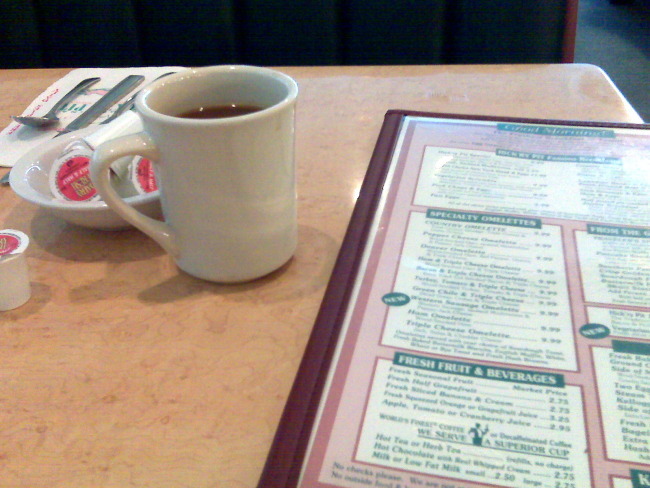 As I sit waiting for my guest at a local diner, I have an epiphany on the what makes us so attracted to the meal in which we break our nightly fast. Let's talk about breakfast. Why do we crave it? Why is it often, "Served All Day"? What is the root of it's universal appeal? I suddenly realized that it's beauty is in it's simplicity; but what makes it so special is it's ability to be customized. At it's foundation you often have eggs, a meat, a leavened bread, a pan-fried bread, some sort of a sweet topping (syrup, jam, etc. ), ketchup, and the ubiquitous Tabasco sauce. What makes it amazing is that the sheer number of unique combination's allow for everyone to eat the same thing, yet completely different from the next person, and also precisely how they like it. This amalgam makes up most fare served up in the finest morning eating establishments. Patron: "Pancake sandwich with bacon, eggs over medium, no runny, sourdough toast." Server: "It doesn't come with toast, honey"
Patron: "OK, no toast then. Or, could I have some on the side?" Server: "What kind of toast?" If you turn off your filter at a busy diner, these conversations pop into your head in a continuous stream. People narcistically order their personal nuances into every distinct piece of the meal, far more than any other. "Extra this" "Light that" "Easy on the..." "Could I have a side of the ... instead?" They've had more practice fine tuning breakfast than lunch, or dinner. Just look at the menu; there may be less than 10 things, all assembled in different ways; like Legos, but for food. As I sneak glances upon my fellow patrons I see two middle aged women eating pancakes with a light touch on the syrup. They have only used about a third of their respective tiny pitchers of the dark stuff. One hasn't even touched her little ball of butter, the other has devoured hers; both are sharing a side of bacon and each are sipping coffee. The man to my right and a little behind me, as I rubber neck in my stealthily way, is devouring scrambled eggs, hash browns, a biscuit (he hasn't touched his butter either), and washing it all down with a glass of milk. He dines alone, slowing as he eats, the last few bites are deliberate and well planned. A small bite of egg, then a stab of the biscuit, a small swipe of marmalade from his knife, and then into the mouth. A foursome of two couples was just seated near me and I have a great vantage point. They begin with three coffees, a tea, and a round of waters with one woman sipping her water from a straw. The woman with the tea has a side of fruit immediately. When they are served, it looks as if something's wrong with the ladies' order, very wrong. They send it back. What emerges a minute or so later looks like Benedict, split with her female friend across the table from her. One of the male counterparts gets eggs that look over easy, white toast, sausage patties, and hash browns. He likes to break everything up at first rather then before each bite (I know the type), and spends a minute or so preparing the plate. The other man does nearly the same, only with links instead. On another note: I just watched a woman pour an unholy amount of sugar into her coffee from the glass jar of sugar. I think there should be a safety valve on those things. She could have put a Shetland pony into hypoglycemia with a dose that size. I'm going to get one egg over-hard (I've not been digging runny yolks lately...), bacon (I had sausage links yesterday), hash browns, a biscuit (I'm going to smother it with my own little round ball of butter and...), and maybe some marmalade. I will add a tablespoon or so of ketchup to the side and likely skip the Tabasco. Coffee with one tub of half & half, no sugar. My cohort, I'm guessing, will order one egg over easy, bacon (or maybe the sausage patty?? ), hash browns, and white toast. He will get two sides of brown gravy and pour it on top of everything. He will spend 90 seconds or so shaking black pepper on top once the roofing of gravy is down - I've never seen someone put more pepper on their food than him. He'll order a side of milk for his coffee in lieu of the half & half tubs, no sugar. So, how do you assemble your ideal "diner breakfast"? Bacon, ham, links, patty, pork chop, or steak? Pancakes, French toast, waffle, or silver dollars? Over easy, over medium, scrambled, poached, or omelet? Hash browns, home fries (triple cheese for $1 more), French fries, or fruit? Sourdough, white, wheat, rye, English muffin, crumpet, or biscuit? Coffee, tea, orange juice, grapefruit, tomato, or milk? Cereal, oatmeal, granola, yogurt, muesli?